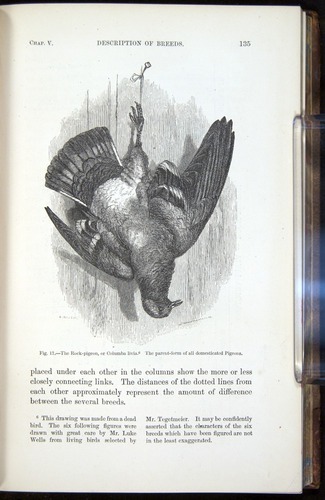 Darwin, Variation of Animals and Plants under Domestication, 2 vols. (1868), vol. 1, F878.1 and vol. 2, F878.2. In a two-volume work, Darwin investigated the degree of variation evident in domesticated animals. For example, the Rock pigeon was the parent form of all domesticated pigeons. 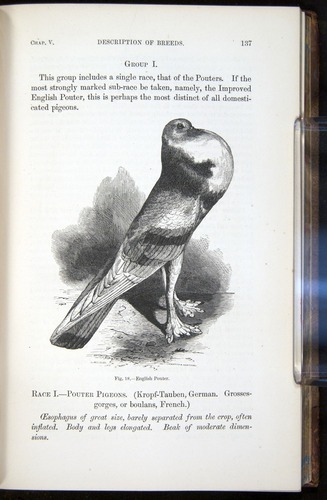 It had given rise to the pouter pigeon, carrier pigeon, fantail pigeon, African owl pigeon and the short-faced tumbler pigeon. 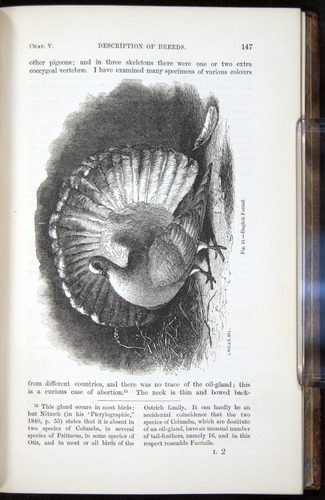 Domestic breeding illustrated Darwin’s argument that the variation present in nature provides ample material upon which natural selection might work.